The July Bloom – Page 5 – The July Bloom: Once upon a time, a flower bloomed in July. 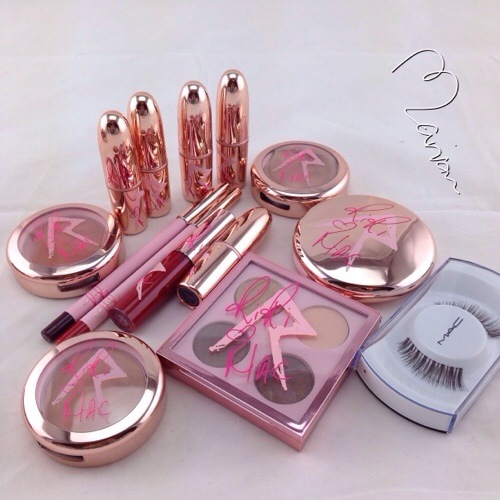 First of all i want to say that i love Hourglass products, i have used a bunch of products and i can tell that they are made of high quality (what this means lol) but seriously you can tell that this brand is really good, alot of people are complaining that their products are a bit pricy but i justify it that they totally worth it, all the products that i used so far are really good and non regretted purchasing. 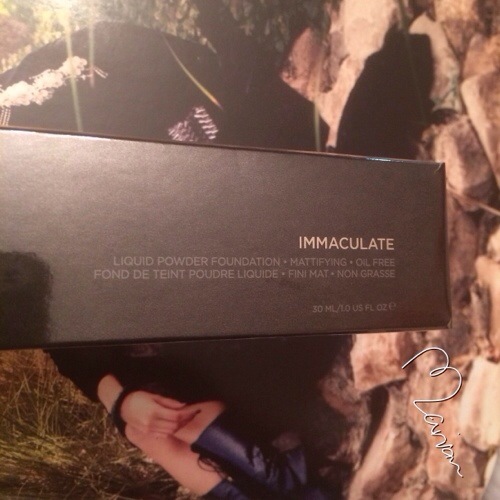 This time i will be reviewing a foundation called Immaculate, i heard so much about it that i had to get it, and since it is a mattifying foundation and i have oily skin i thought it will work well on my skin. This foundation is actually a “liquid powder”, you pump the product out of the can and you get a foaming kind of liquid, but once you blend it turns out powder, not like a loose or compact powder, but they just said it right a liquid powder. 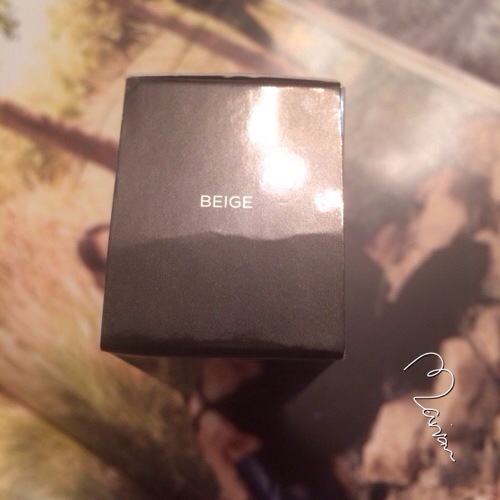 I took the risk and ordered online without knowing my shade, i checked some swatches online and decided that Beige could be my shade, and thank god it turn out to be. I might try a bit of a lighter shade next time just to check how their shades work. Now the foundation bottle first comes with a cover, and there is an extra pump in the packaging, once i got it i removed the bottle’s cover and placed the pump, i have no idea why they did it this way, i cannot imagine why would someone use a foundation without a pump, i have experienced how annoying a foundation bottle can be without a pump, you cannot get the right amount out, it is either too little or too much. 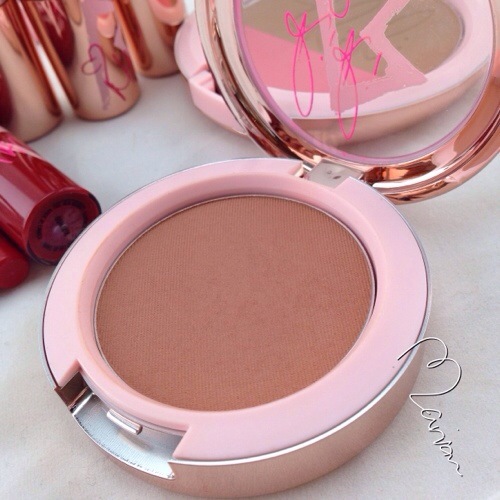 Pumps usually give a reasonable amount of products, it is never too little or too much, just a perfect amount. 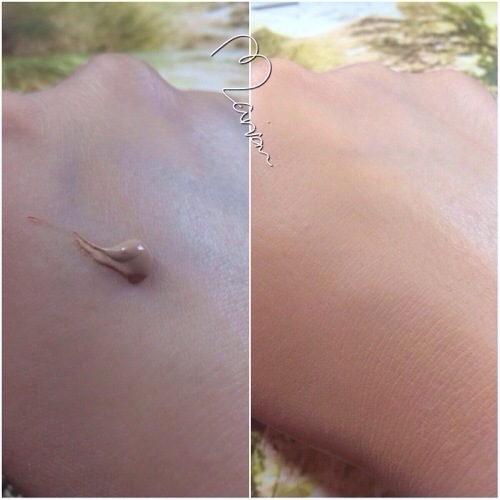 Here is a swatch of the product, on the left is the amount of foundation that comes out of a single pump, on the left is how it looks like blended on the back of my hand. My thoughts of the product: it works great on oily skin, it is indeed applied as liquid and goes on a bit powdery, plus it has a matte finish. 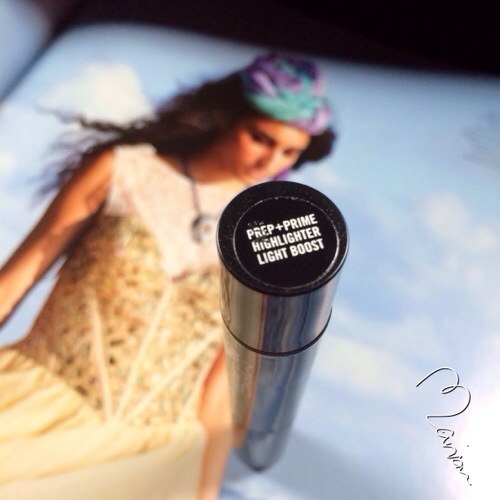 It doesnt get oily during the day and lasts long. 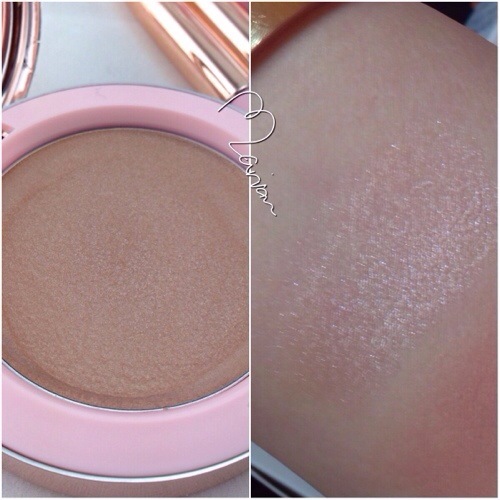 The coverage is light to medium, i dont like to build up my foundation so it wont look cakey but i only add a bit of concealer on any blemishes if needed. I am loving this product so far and i know i will like it even more during the summer when my face gets more oily because of the heat, i am not a big fan of matte finishes, i always prefer foundations with dewy finishes but it doesnt mean i wont love a good matte one. MAC is well known with its wide selection of lipsticks from its permanent range, the PRO range and also the ones that come in Limited Edition, i have collected them for years only to realise i was building a MAC empire of all Limited Edition ones and i had few from the permanent, so in the last couple of years i started to expand my permanent lipstick collection and boy how i missed alot of good stuff!! 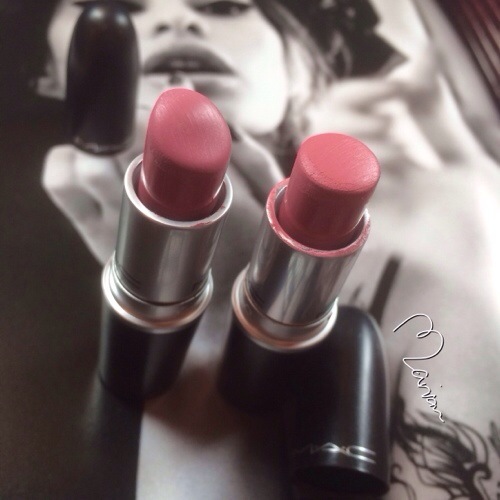 I wont show every single lipstick i love by MAC but those two i have been really loving, and let me tell you that i am not a pink lipstick (nor blush) kind of girl, i rarely wear them, but those two are amazing, the kind of pink that i really love and wouldnt mind wearing everyday. 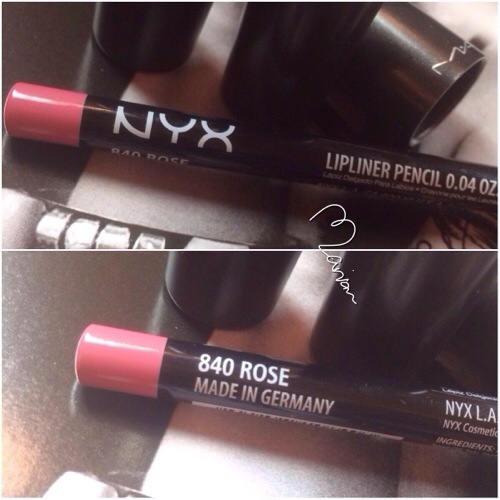 The first color is called Pink Plaid which is a purple pink, has a blue undertone, and it comes in a matte finish, i didnt match it with a lipliner yet but i’ve always used it with NYX lipliner in Rose, which is a perfect match with my other favorite pink lipstick that is called Please Me, it has a yellow undertone and also has a matte finish. 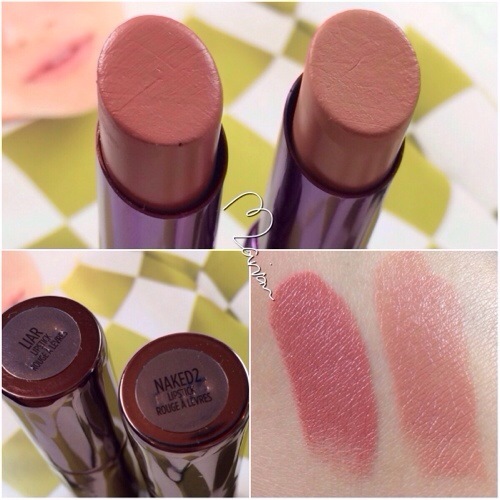 Matte finishes are sometimes annoying because they dry the lips but i always make sure to apply a hint of lipbalm before wearing a matte lipstick. 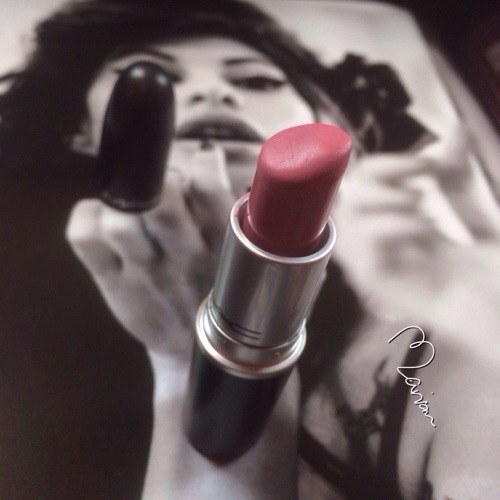 Over the years I have noticed an increase in MAC lipstick prices, i remember when they were sold for around AED 75 or maybe less and the saleslady was all bragging how they keep their prices reasonable because they recycle the packaging, and the last time i purchased a MAC lipstick they were sold for AED 100!! As soon as i heard Hourglass Cosmetics are going to launch a new blush line i couldnt wait to order, i wasnt able to order when it first launched because everything was sold out in no time, after few days i found the two that i ordered were back in stock but the rest werent, so i ordered them immediately. 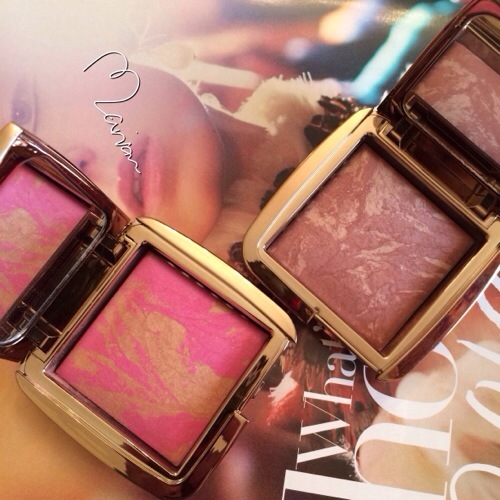 First of all let me say what is special about those blushes that a blush color is mixed with the famous Hourglass Ambient Lighting Powders, and if you are familiar with those Powders you will notice that the names of the blushes are connected with them. 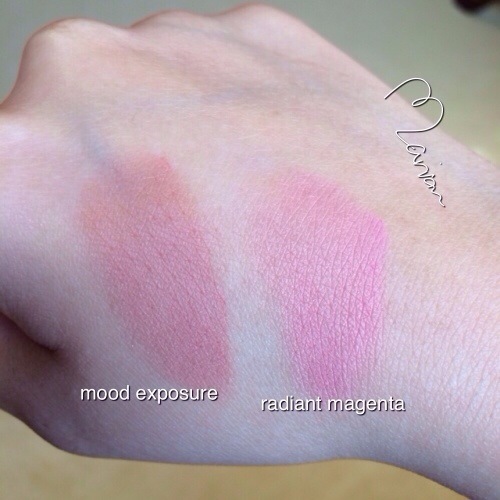 For example, the blush on the right is called Mood Exposure and there is a Lighting Powder called Mood Light, and the blush on the left is called Radiant Magenta and the Lighting Powder is called Radiant Light. The blushes that i got are really amazing, i didnt expect them to be this beautiful in real and they are gorgeous in wear. 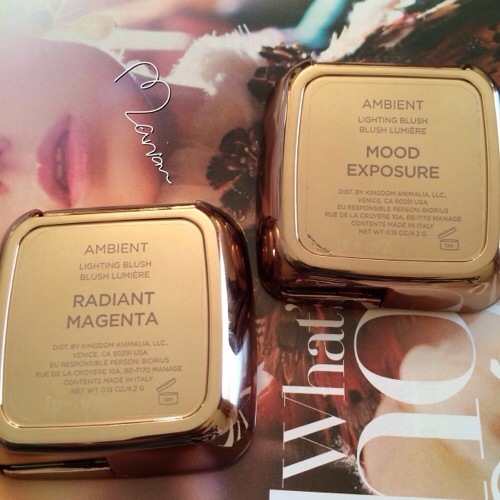 My favorite of the two is Mood Exposure and i wearing it alsmost everytime i wear makeup, yes it is this beautiful. 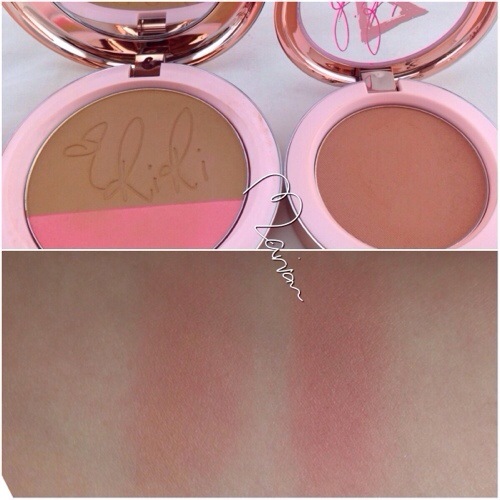 As for Radiant Magenta, i loved it too even though i am not a pink blush kind of girl, i rarely use them but i think the secret that makes it very wearable to me is that it is mixed with the Lighting Powder. 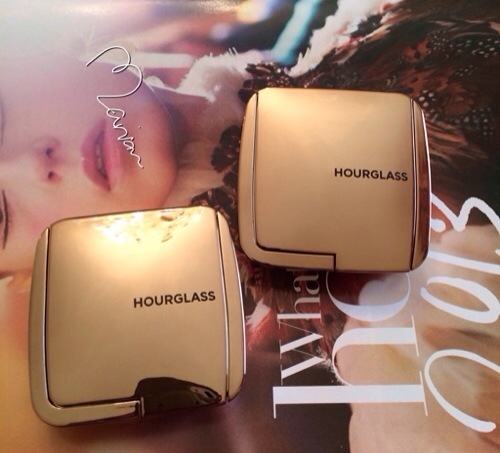 I ordered mine for $35 each from www.hourglasscosmetics.com using MyUS forwarding company, they are also available at www.sephora.com for the same price. 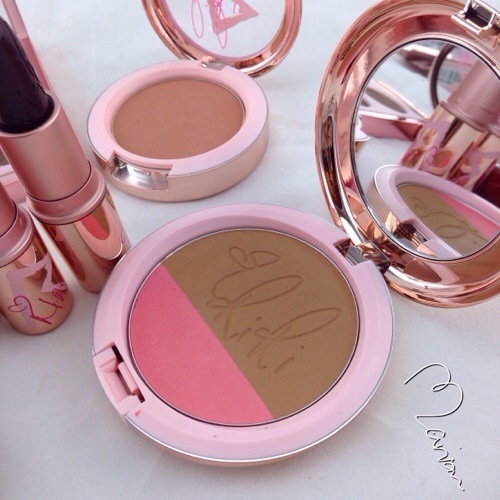 Hourglass Cosmetics are kind of expensive but they are totally worth it, every item i purchased and used i totally loved. 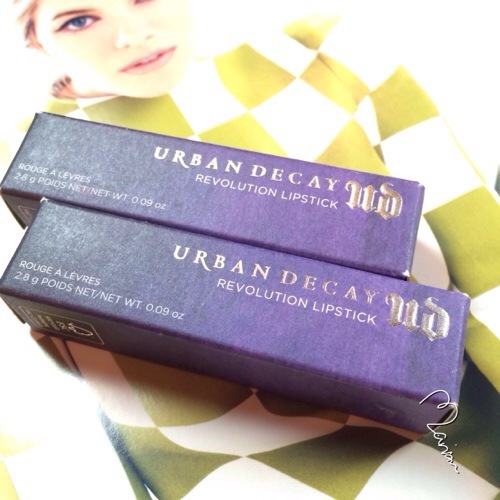 I’ve always wanted to get Urban Decay Revolution lipstick and i kept delaying since forever, i actually wanted to get 4 shades but when i went to Sephora and checked them i couldnt find the other two, they werent even available in testers so the saleslady said that they might not got all colors, but i ended getting the other 2 shades in Liar and Naked2. 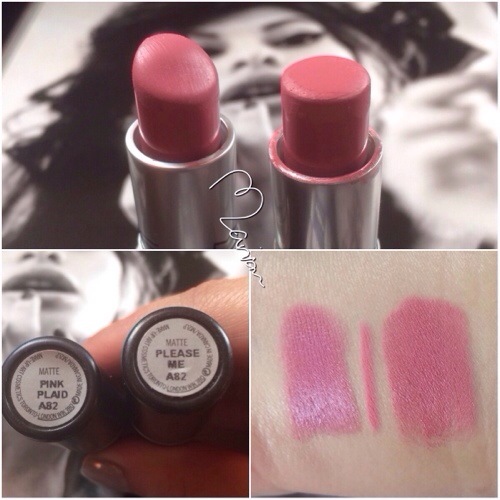 The lipsticks are amazing, they are creamy and opaque, they moisturize very well and they stay long except while eating or drinking because they stay creamy while wearing and they never dry out. 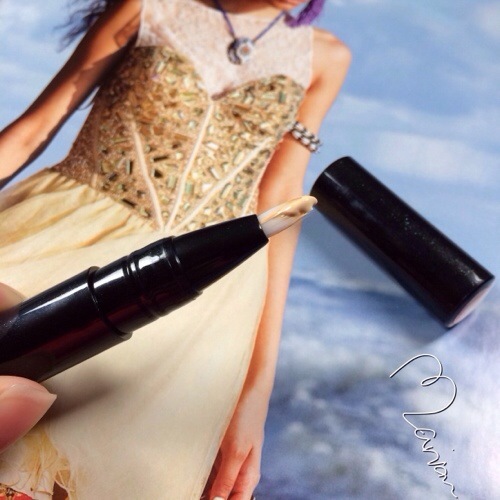 The only problem, in my opinion, is the shade of the lipsticks, i dont like this flat round tip shape, it makes it very hard to actually draw the lipstick in the shape of the lips, i always end up wiping and correcting the edge lines. 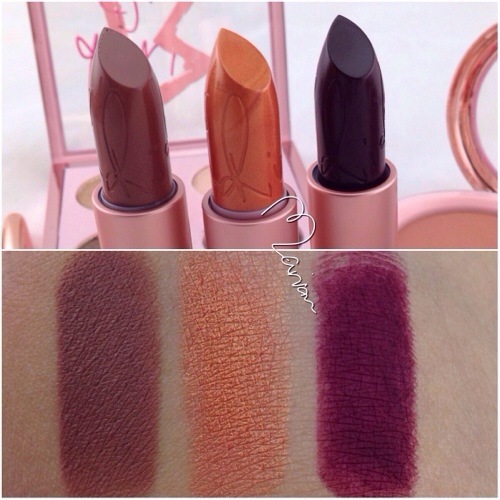 They are kind of similar to MAC Sheen Supreme lipsticks but i believe UD are more opaque, they are very similar in the finish and even the lipstick’s flat tip shape which is also annoying but they soften while use. 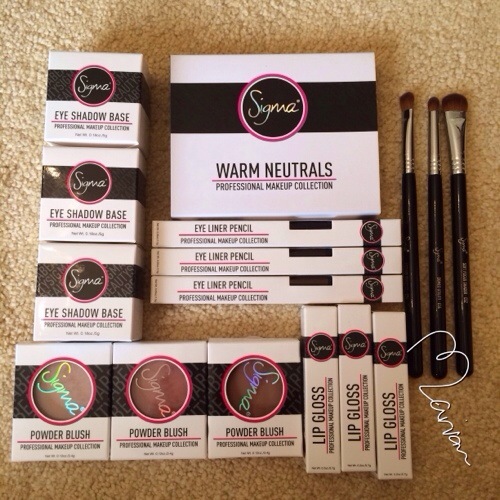 Hello everyone, today i will be talking about Sigma Beauty Enlight Collection, it was launched few months ago and i had it on my wishlist since then, finally had the chance to order it online from a local website called www.laylam.ae , i am very skeptic when it comes to ordering from local websites because i dont want to pay more on the products that their original price, i only do it if i wanted the product ASAP and i try not to minimize my order as much as i can. But www.laylam.ae was selling Enlight Collection for almost the same as the original price, only few dirhams more and that’s why i didnt think twice before ordering. 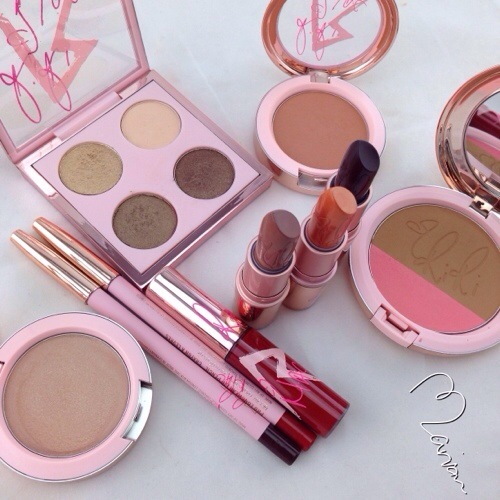 The entire collection comes with an eyeshadow palette, three eyeshadow bases, three blushes, 3 eye pencils, 3 lip glosses and 3 eye brushes. Enlight collection can be purchased as a whole collection or each item can be purchased separately. The first item is the eyeshadow palette which is called Warm Neutrals, it contain 12 neutral eyeshadows from matte to shimmery. 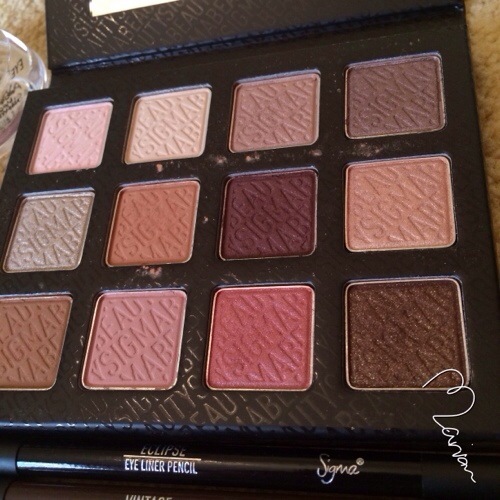 The palette is small and handy and comes with a mirror from the inside. 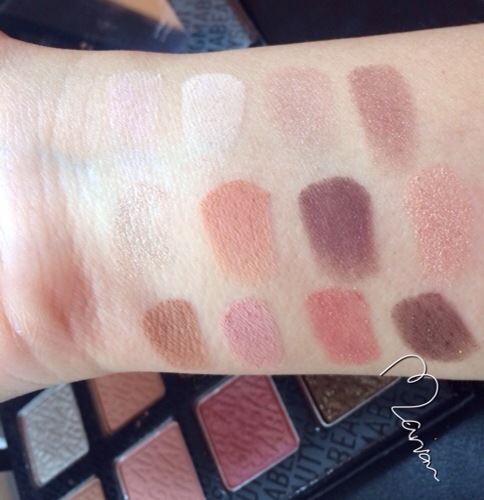 As you can see from the swatches of all colors that they are highly pigmented, i barely touched the eyeshadow surface and came a good amount of product, the color payoff is really great and the color range is beautiful. All colors are very wearable and suitable to wear at anytime, a soft look can be created from this palette and also a dark one. 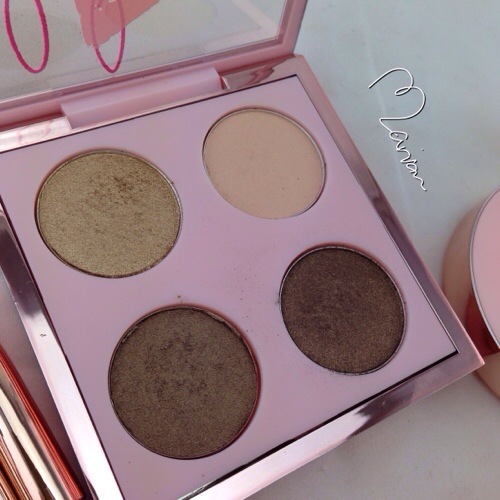 The only downfall in this palette that there is no shimmery highlighting color that can be used on the brow bone or in the inside corners of the eyes so i have to use a different product to complete the look. 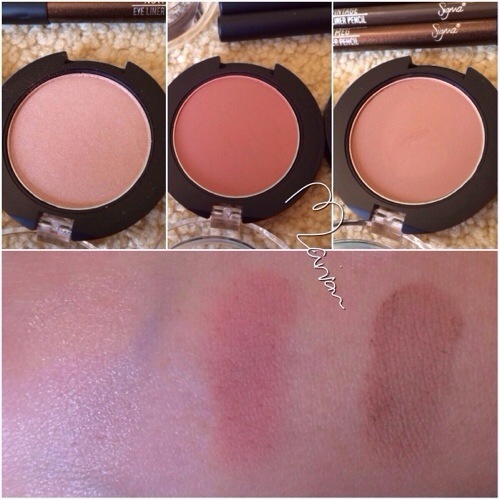 Englight collection has three different blushes, actually those are made as a highlight, a blush and a bronzer. They actually look way darker in the pan than when they are swatched, all colors are beautiful and will compliment most skintones. For some reason i couldnt swatch the highlight color properly, it usually shows off really pretty in real but i couldnt take a proper photo of it. 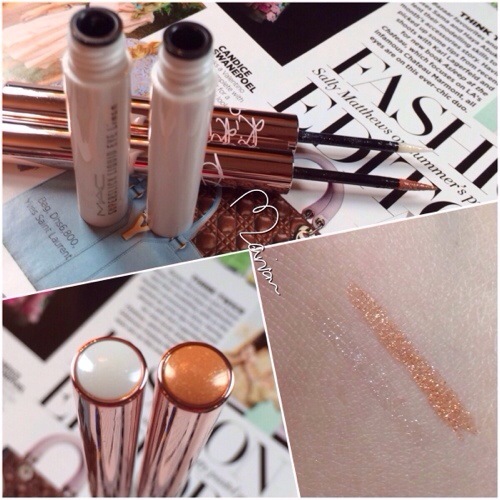 The highlight shade is called Peaceful, the blush shade is called Serene, and the bronze shade is called Mellow. 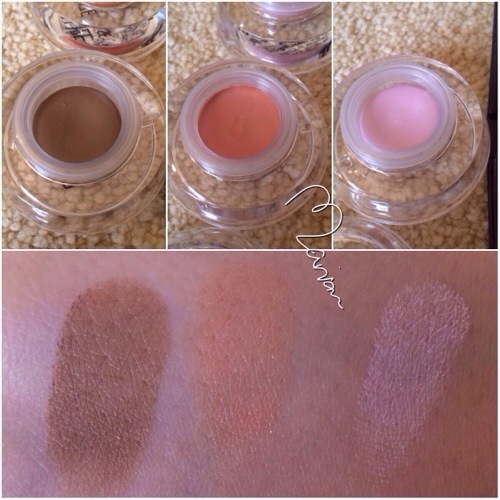 And now come the eye shadow bases, Sigma has made some before and they were amazing, they are very creamy and can work as an eyeshadow primer/base and wont let the eyeshadow crease even without a primer. 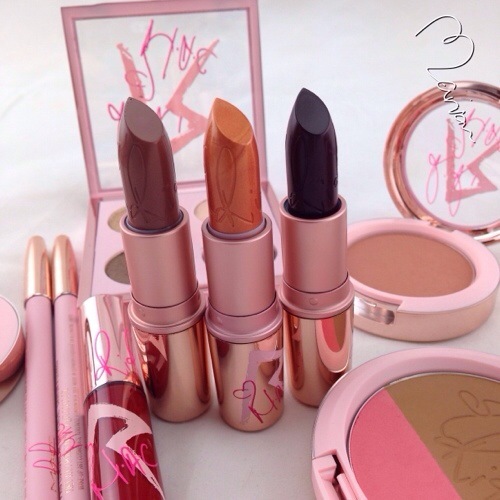 The brown shade is called Composed, the peach shade is called Neutralize and the light pink shade is called Awake. 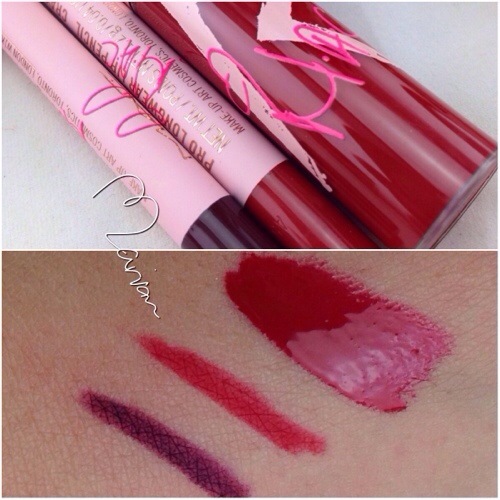 As for the lip glosses i didnt really like them that much, they look really pretty in their packaging and also when i swatched them but they barely have any color once applied on the lips, they almost look like a clear gloss, they are also heavily scented in vanilla, which they smell nice but they taste like medicine. 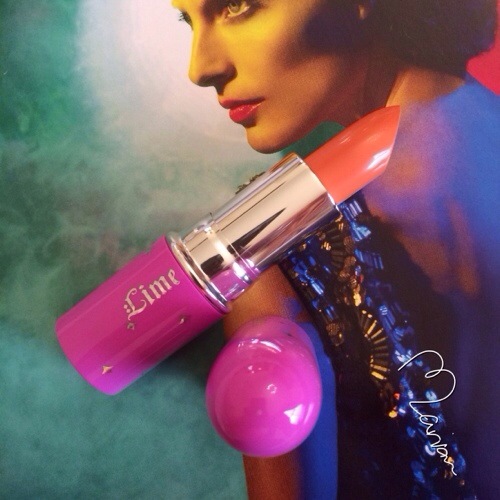 The light purple shade is called Hint, the dark spicy shade is called Tranquil and the peachy shade is called Tint. 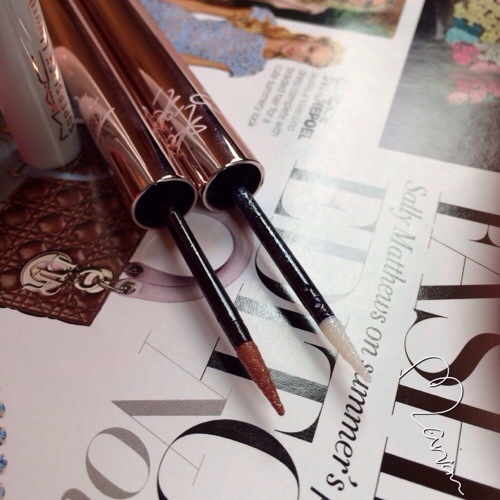 The eye pencils come in 3 shades, one black called Eclipse and two browns, a matte one called Vintage and a shimmery one called Nutmeg. 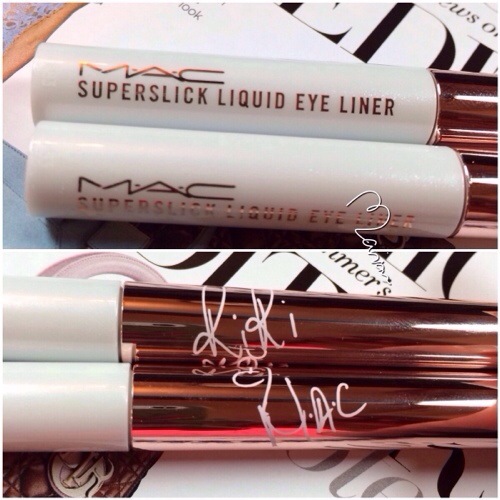 They run smoothly and i like to use them as an eyeliner and smudge it a bit with a brush to look soft. 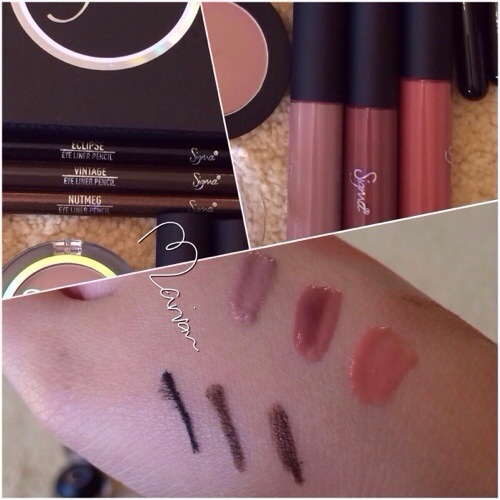 They are not the long lasting kind as i was able to wipe them off my hand very easily after i swatched them, but they lasted perfectly when i applied them on my eyes, i didnt use them as a kohl yet so i am not sure if they will stay put. Lastly, the collection also comes with 3 different eye brushes, all of them are new and they look kind of similar to the ones from the Extreme Color Payoff set. The brush on the left is E34-Domed Utility, the one in the center is E54-Medium Sweeper, and the one on the right is E52-Soft Focus Shader. 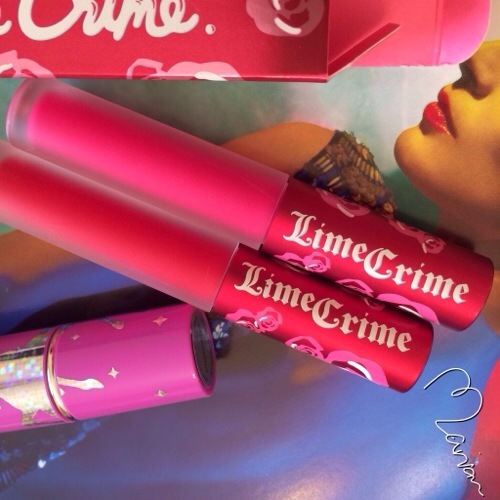 Overall, the collection is really great, i loved everything about it except for the lip glosses which were almost useless, they barely gave any color unlike as they were described in the website that they were opaque, which they werent! They might look better over a lipstick, or if you seek a very natural looking lips. 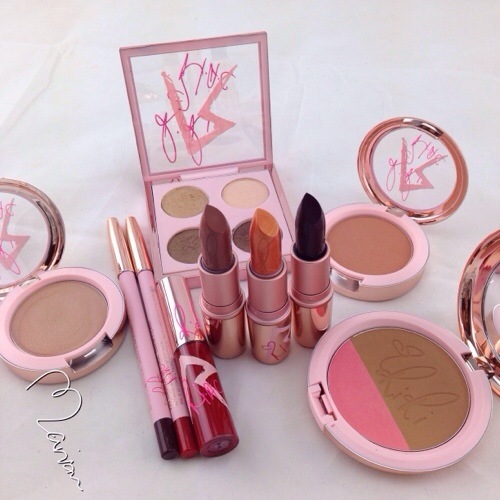 I was supposed to post this one once the i got the products a very long time ago!! The file was just kept there in the draft section and totally forgot about it! Anyways better late than never. 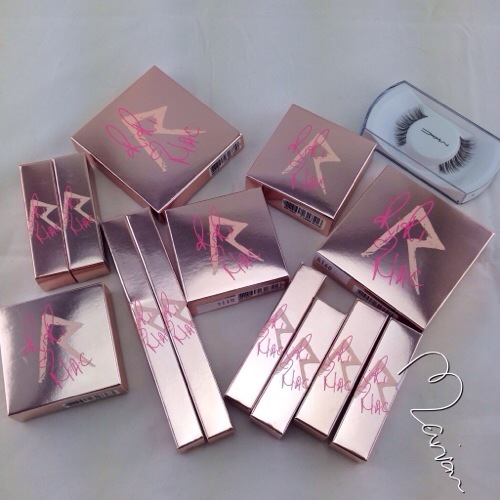 Those are the products that i finally got when RiRi Hearts MAC collection was launched in Abu Dhabi, before i got some products online but most of them were damaged and i couldnt get everything i want because most of them were sold out. Hello everyone!! i wanted to blog for a long time but i was facing a login problem for a while and didnt know how to fix it, did some research until i found out what was causing it and fixed it instantly. 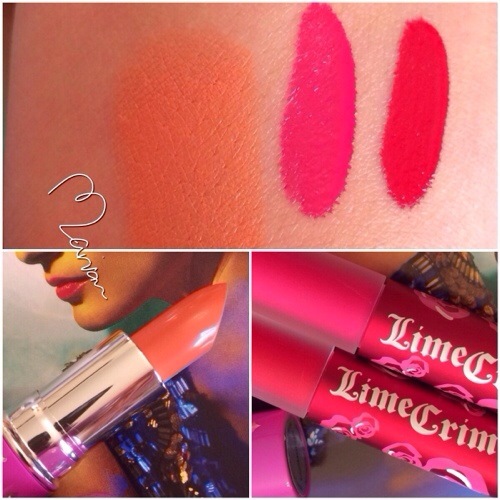 I had to order some Lime Crime lippies for the new year, heard alot about those Velvetines lip glosses, or lipstick because they are very pigmented and once they dry the go matte, havent used them yet but hopefully will have a reason to very soon 🙂 I got two shades of Velvetines in red which is called Red Velvet and in pink which is called Pink Velvet, there is a third shade called Suedberry but i didnt get it. They cost $20 each. 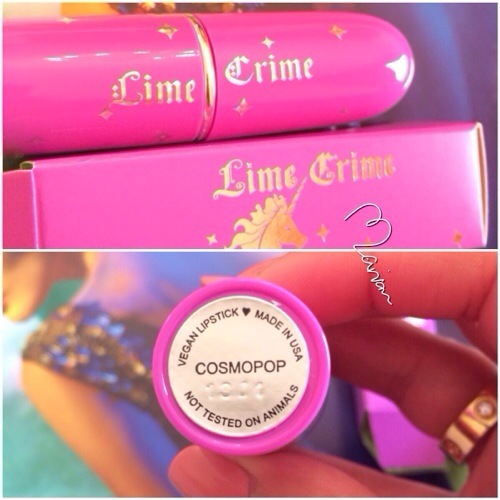 I also got one Opague Lipstick in Cosmopop, i know how amazing those lipsticks are because i got one years back called Airborne Unicorn which is opaque and creamy. 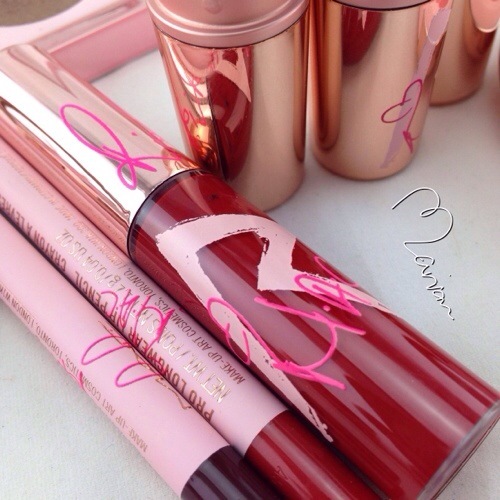 The lipstick costs $18. 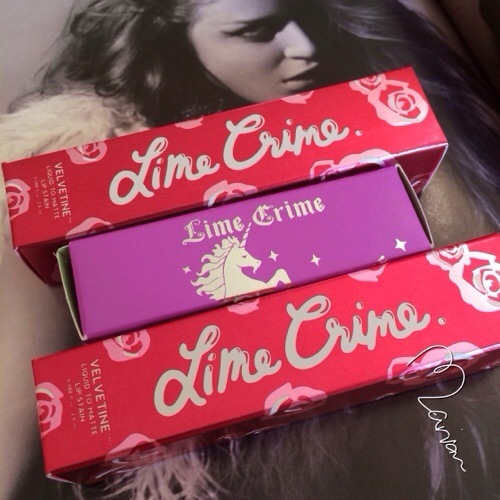 I ordered them from LimeCrime.com and they do ship worldwide. 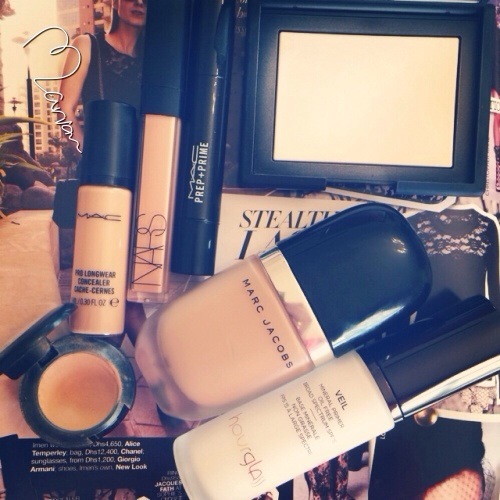 Wanted to show you what is my current favorite foundation routine, this is for an everyday normal look, i dont normally go heavy except for special occasions which i need more coverage. 1. Apply Hourglass Veil primer, i love this one it doesnt feel thick and makes my skin smooth and preps it for foundation application. 2. Marc Jacobs foundation, what i love about it that it is sheer, it has a satin finish but goes a bit matte which is suitable for oily skin. 3. 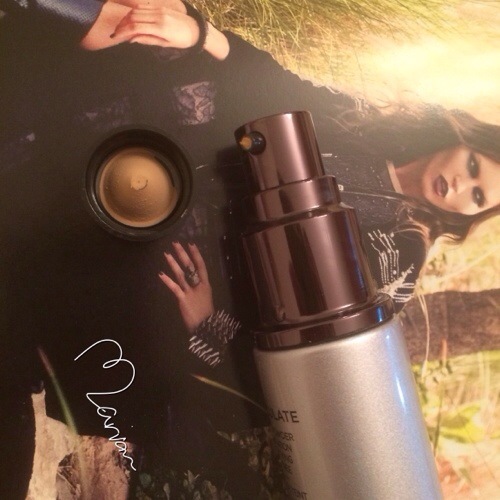 For concealer i apply MAC ProLongwear on my undereye area, blend it very well, this is a great product and will work great for people with serious dark areas. I sometimes alternate with NARS Radiant Creamy Concealer in shade Biscuit, this shade is on the peach side which i like to use when i dont sleep well and that what causes more darkness on my undereye area. 4. 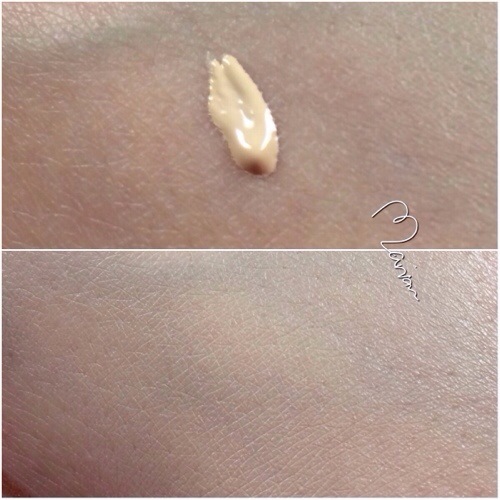 I like to highlight my under eye area after applying concealer which i use MAC Prep+Prime Highlight in Light Boost, again this is a great product, comes in shades but Light Boost is perfect, it is a light yellow shades which gives a natural light, can be used on any area on the face to highlight. 5. For concealing any blemishes and imperfections on my skin i use MAC Studio Fix concealer directly on the spots, it gives enough coverage to conceal them. 6. Finally i powder my whole face and the undereye area with NARS Light Reflecting Setting Powder, it blurs imperfections and doesnt show pores, plus it gives a glow to the skin, it has a bit of a shimmer but in a good way, i love this product it makes my skin look really nice and glowy. 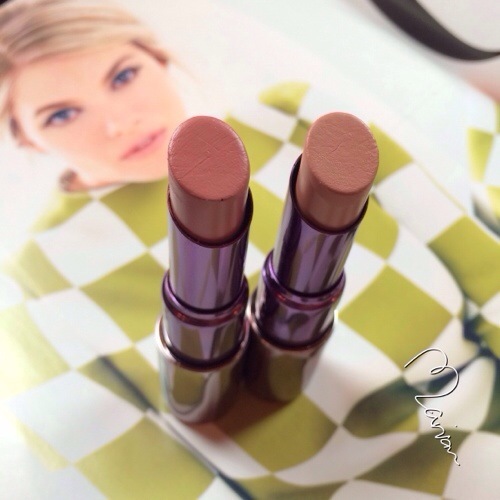 – For foundation i use Sigma F80, or Sigma F82, or Sigma F84, all of them are perfect for applying foundations. – For under eye concealer/highlight i use Sigma F86, i love the pointy shape which makes it easy to blend under the eyes. 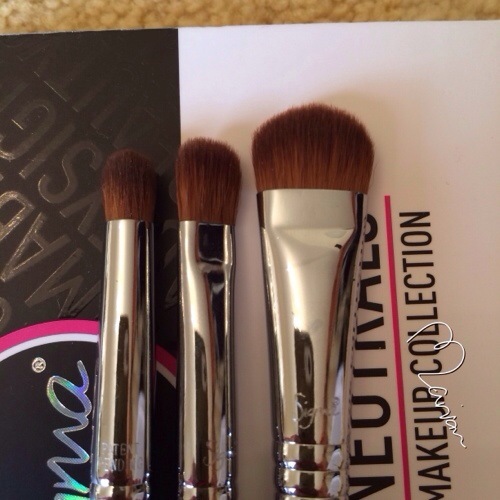 – For concealing blemishes i use Sigma P80, or Sigma P82, those work like the foundation brushes which pack products and blend in a nice way but i always prefer to go back with my foundation brush and dab on the concealed area. – For powdering my under eye area i prefer using Sigma F35 which is a small tapered brush, and for my face i use Sigma F25 which is a big tapered brush. 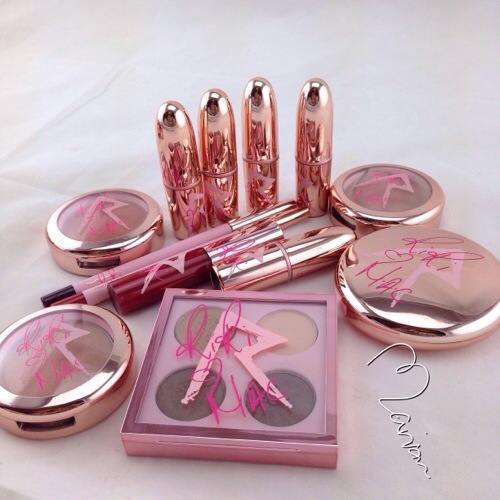 I wasnt lucky enough to get my hands on whatever i want from RiRi Hearts MAC holiday collection, i believe i havent posted about my first purchase but probably i didnt take any photos of the products yet. 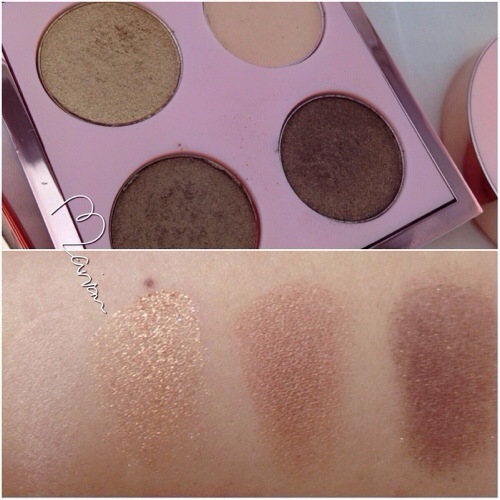 Well this post seems a bit late for the collection anyways but just wanted to share with you some photos, swatches and my thoughts about those products. Those are called Superslick Liquid Eyeliner, the brush is spongy which i prefer for applying eyeliner and it is fine and small. Both colors are glittery, the golden one is called Cockiness and the white one is called Pisces Persuasion. I just got them recently so i didnt have a chance to use them yet but they look suitable to be applied on the lower lash line to add a bit of color/glitter to the look. 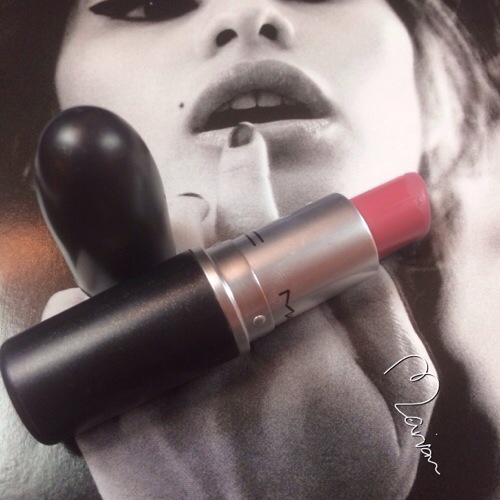 RiRi Hearts MAC holiday collection is still available online at maccosmetics.com but the lipsticks are sold out. 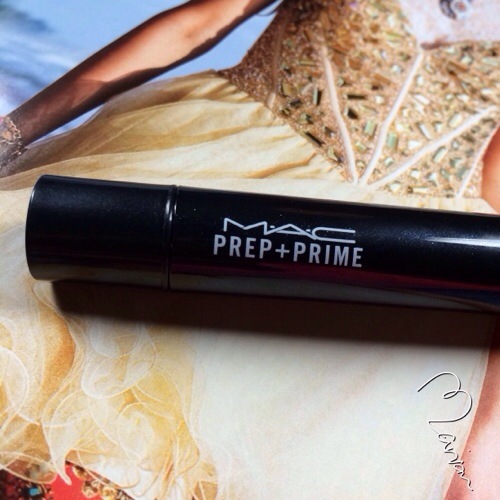 This is a versatile pen brush highlighter from the Prep+Prime collection by MAC, it can be used as a regular concealer if you dont have serious dark areas under the eyes, or it can be used as intended to highlight after the concealer and also other areas of the face such as forehead, chin and cheek, just wherever needed to highlight any area. 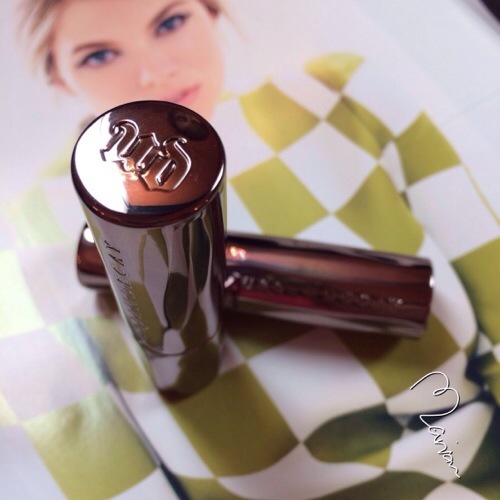 This product is almost the same as YSL Touche Eclat Radiant Touch that also comes in the same shape. This product comes in 4 shades and the one i have is called Light Boost which is a light yellow shade. 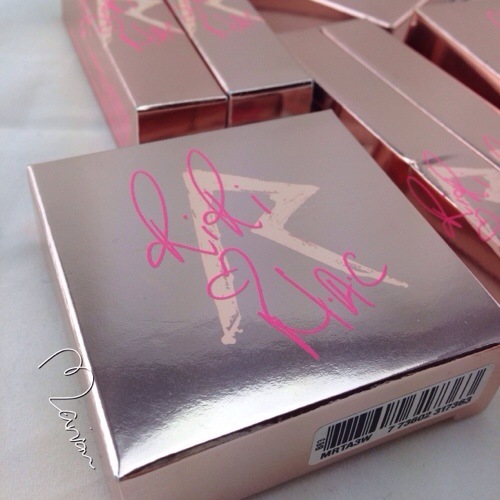 I have noticed this product is always out of stock at our stores, and i have ordered mine online from mac website. 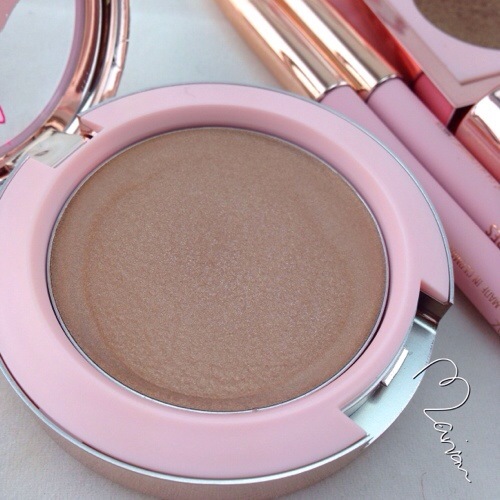 This is one of the best products i have used, i have serious dark undereye areas and i always prefer to use peachy toned concealers to correct those dark shades but i also like to highlight the same area, i dont like to add another concealer on top since products tend to settle on fine lines, this product does a great job in highlighting and it is not as heavy as a concealer, it brightens and awakens the eyes.